Join me on a great excursion to more of the wonders in the Inyo Mountains and the far northern reaches of Death Valley! ...the reality was that the roads up to eleven thousand feet were easily passable. In the years since I have been in this area some new growth has occurred in the forest! This antenna is part of the Owens Valley Radio Observatory (OVRO) millimeter-wave interferometer project called Combined Array for Research in Millimeter-wave Astronomy (CARMA) http://www.mmarray.org/. The drive was longer and more winding than I recalled but the views of the Eastern Sierra were always breathtaking. Soon I was at the site of more ancient growth and the area was completely deserted. The late afternoon sun was trying to pierce the clouds and photography was a bit difficult, but who could resist taking a few photos of such amazing trees? The setting sun and some billowy clouds capped the end of my photo efforts. The winds were driving hard and the temperatures plummeted to 27 degrees without wind chill. The Grandview campground was deserted that night. 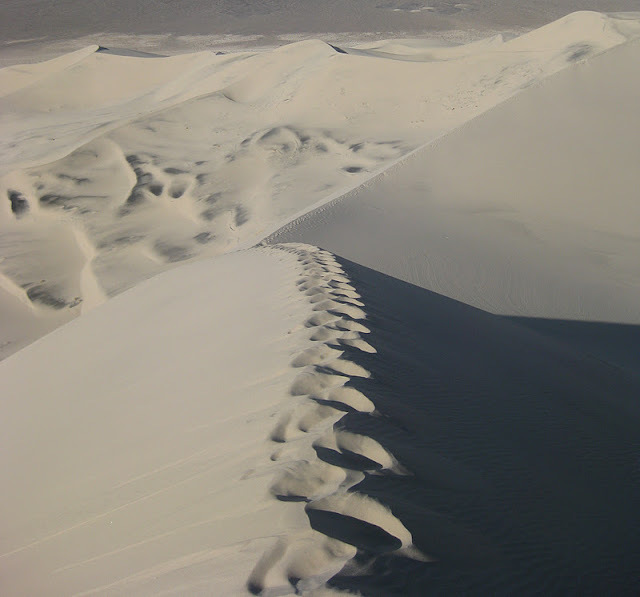 The next day started with an easy drive to the Eureka Sand Dunes, perhaps the tallest of all dunes in North America and said to reach 700 feet above the arid and rocky desert floor. Along the way I spotted many enticing 4x4 trails which may provide the basis for the next trip. The dunes can be spotted from many miles away and they just keep growing in size as you get closer. Along the way were many desert plants to be viewed, but not easily touched! The height of the dunes continued to amaze me as I came closer, but still 3 miles out! 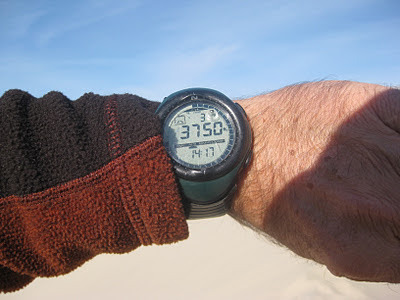 The notion of climbing up the sheer faces of the tallest dunes was quickly discarded in favor of a longer and more scenic ridge route, starting from the parking area which was a short hike from the base of the dunes. But I soon faced a steep climb to gain the main ridge. Whose idea was this anyhow? Gazing skyward as I trudged up the slope I could just make out some of our skilled and dedicated military pilots in F-18s, performing a refueling dance with a tanker. Now I had gained the upper ridgeline and the views became even more exciting! Soon I was treading the narrow ridgelines, reminding me of previous mountaineering climbs along high alpine ridges of wind driven snow. Look at the southerly views! And look who else is enjoying the views!!! These two USMC AV-8 Harrier jump jets flew below me and looked up at me on the ridge! Those roaring jet engines were the sound of Freedom! Soon it was time for an alpine style descent with hard heel stomps into the steep slope for a 600 foot romp down the face of the dune. It was funny to see the resemblance of my tracks to the little tracks that the dune bug from Wyoming left...... maybe we have a common love of exploring? The next day I was on the highway home and swung into the Alabama Hills near Lone Pine. It started to rain so I zoomed over to Horseshoe Meadow Road to catch some fresh snow before I drove home. I was now running out of time and needed to head back down Lubkin road to 395. I'll wave goodbye to all of you for now and I'll be posting more of this year's adventures before 2011 turns to 2012! Thank you for visiting my site! It is a little over a year now and I am always amazed by how many of you come to visit. Thank you so much! Once again, living vicariously thru you Jim! Great post! I always enjoy your posts.